A baked potato bar saves time and gives your guests options. When you've got to serve dinner to a large crowd, it typically means a long day in the kitchen. However, you can save yourself a lot of trouble by preparing a baked potato bar for your dinner guests. Prepare your toppings the night before and bake the potatoes before the gathering to make your baked potato bar come together quickly. Select baking potatoes, which usually are labeled russet or Idaho in the grocery store. Plan for two potatoes per person and bake them a couple hours ahead of time. To bake potatoes, scrub them, rub them with a little vegetable oil, pierce them with a fork and toss them in a hot oven to bake until tender. While many people wrap the potatoes in foil, this is not necessary and prevents the potato skins from crisping up. Instead, place the oiled potatoes directly on your oven racks to bake. To keep the potatoes warm on your potato bar, heat up a ceramic platter in the oven and place the potatoes on it just before serving. Ceramic retains heat much longer than other types of plates. Prepare your toppings the night before your party. For the simplest baked potato bar, provide basic toppings such as butter, sour cream, cheddar cheese, chopped chives and bacon bits. You also could serve chili as a potato topping and a side dish. For a more complex potato bar with a wider variety of options, prepare two or three toppings, such as sauteed broccoli and diced peppers, or meat toppings such as shredded chicken and sliced flank steak. Offer a variety of sauces like hot sauce, barbecue sauce, steak sauce, Alfredo sauce and traditional gravy. Set up the baked potato bar so that your guests can serve themselves efficiently. For a large crowd, stack plates and heaps of baked potatoes on opposite ends of a table. That way, you can have two lines of guests dressing their potatoes instead of one. Place the toppings in medium-size serving bowls, and line them up neatly in the middle of the table, so that they are reachable from either side. If you have tiered serving platters, place the bowls on those. Serve hot toppings, like chili, vegetables and meats, in standard hot food serving dishes. Put labels in front of the bowls to make it easier for guests to spot the toppings they want quickly. Starch-loaded potatoes can be a bit heavy, so consider serving some lighter sides to balance things out. A salad prepared with any type of green is an excellent option, but skip the heavy dressings like ranch and opt for a vinaigrette. A cold cucumber or a chilled green bean salad also would makes a light, tasty side. 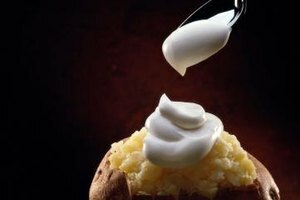 Note that baked potatoes and toppings are perishable and should not be left out at room temperature for no more than two hours. Keep all of your toppings refrigerated at temperatures 40 degrees Fahrenheit or below until right before serving time. Keep the potatoes warm in the oven at 140 F until you are ready to serve them. Consider setting the bowls in which you place salads and toppings that need to remain cold, like cheese and sour cream, on top of crushed ice. What Is the Best Way to Cook Steak & Potatoes Together in the Oven?